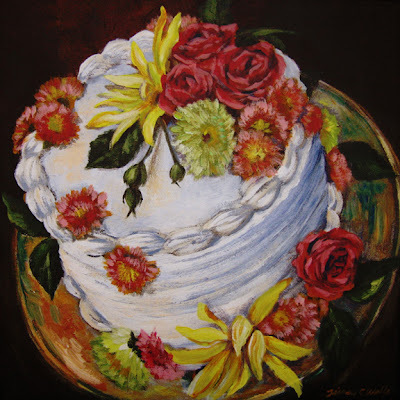 For a special birthday for my grandmother a few years back, I decorated a simple white cake with flowers, and later painted a small 12" x 12" canvas of the image. It makes for festive decor when celebrating a birthday. 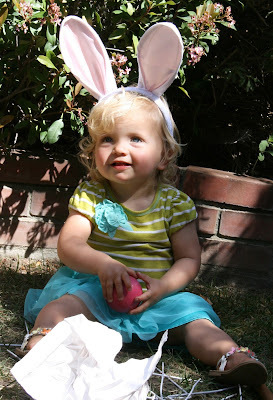 This past weekend, my little Genevieve left the 'terrible 2's' behind and turned three years old! Such a big girl now. 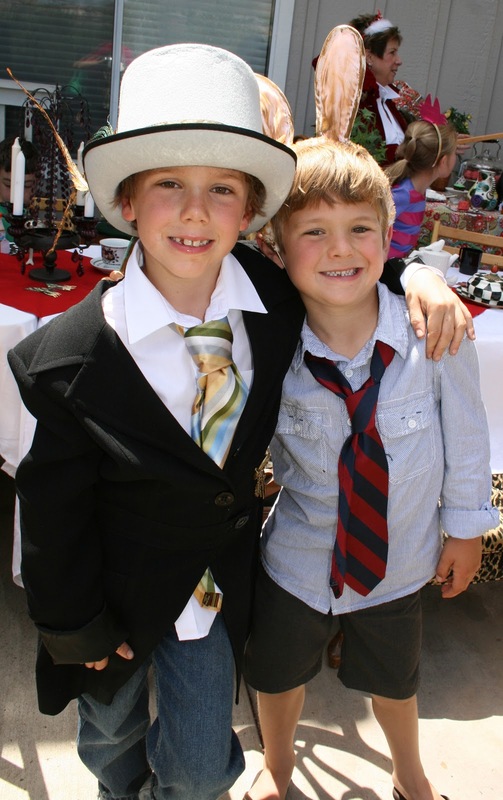 We had a sweet celebration, all in an Alice in Wonderland theme...specifically a Mad Hatter Tea Party. With both boys and girls coming to the party, and Genevieve's love of tea parties, it seemed like a good fit. 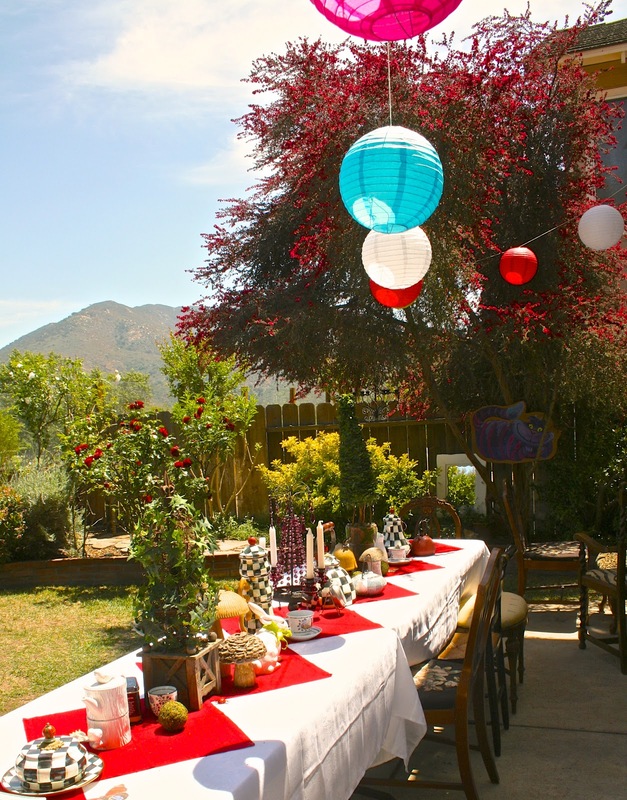 Decorating for the party was great fun! My sister-in-law was a huge help (actually, I am sure I could have never pulled it together without her). That morning we attempted to transform my backyard into Wonderland! We strung paper lanterns, set the long table with tea pots, large mushrooms, bugs, a chandelier, topiaries, tea cups, etc. I stuck with a black and white color scheme and added pops of color. I dragged out every interesting chair and ottoman I had to put around the table. In the yard I hung a chandelier in the tree, propped up mirrors, frames, paintings, and hidden creatures in the bushes. I had painted the Cheshire Cat, and Absolom the Caterpillar on cardboard and tucked them in the shrubbery as well. In search of costumes for the Alice theme, my mom and I found this dress packed away in a trunk at her house. She had made it for me when I was about the same age, to be the flower girl in my Aunt and Uncle's wedding. It was just Genevieve's size, and she thought it was a perfect party dress! The history brought a smile to my face and made it special. A few hats, props, and costumes always make kids parties more fun (and a little champagne for the grown-ups never hurts either). I made a crazy hat for big brother Kenny to play the Mad Hatter. I rallied some party goers to dress as the March Hare, White Rabbit, Queen of Hearts, a Card, and the Cheshire Cat. And me...? A talking Flower, what else? I served "tea" (ok, iced tea, lemonade, and punch...it was almost 80 degrees), and cakes. The kids were all seated and I announced that we were celebrating everyones Unbirthday, and Genevieve's Birthday! The cupcakes had mini playing cards stuck in each one, and Genevieve's had a flower with her face glued onto the center. The adults had their choice of chocolate heart shaped cake, raspberry-lemon rose cakes, or cupcakes. As I was baking away for the whole week prior, I decided to bake a little more and have an old-fashioned Cake Walk at the party. The kids circled the table while tunes from the movie played; they stopped at a numbered chair when the music stopped. If their number was drawn, they got to choose from 5 mini cakes. The next game was the old 'pin the tail on the donkey', except this was Pin-the-Grin-on-the-Cheshire-Cat! 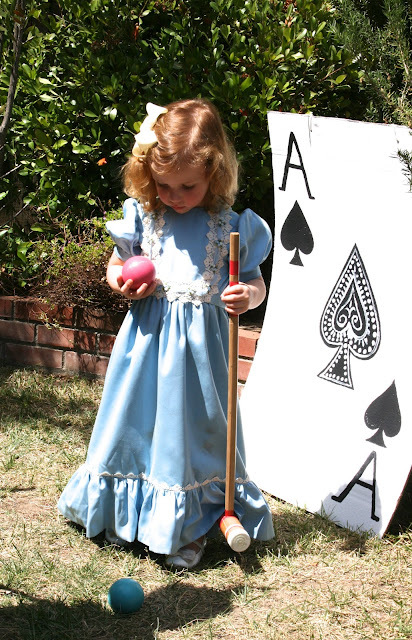 Then, just like in Wonderland, we moved on to Croquet! I have to say that I had a ball planning this! Who knows how much time I spent, all for three short hours of fun...but no regrets, I'll make up for the lost sleep somehow. The memory of laughter and smiling faces makes it all worth it. Happy Birthday, Genevieve...and a very Merry Unbirthday to You! A while back, I was at Anthropology, where rarely can I afford to buy anything, but enjoy wandering through the shop and soaking up the creativity. That particular day I saw this amazing tiered dish with layer upon layer of tea pots and other dishes attached, together forming a wonderful tower. It was horribly expensive, and even if I could afford it, where would I store such a thing? I decided I surely could make something like it. I found an inexpensive white tea set and started stacking with my dishes. I certainly didn't want to permanently glue my plates to this contraption and started brainstorming other options...Ah-Ha! What if I used poster putty to attach the dishes together? It worked! This stack is held together with nothing but poster putty (purchased at Staples) on the tops and bottoms of each center piece. I finished it off by using the putty to attach tea spoon and small cocktail forks to the plates. When I was finished using it for the party, I carefully pulled it apart. It added splash and whimsy to my serving table. Give it a try!